Capable Partners Program (CAP)/AED in partnership with Management System International organised a MSI certificate program for evaluation from May to July 2006 in three phases for ATSEC members drawn from Bangladesh, Nepal, Sri Lanka and India. The program was held at Hotel Nikko International New Delhi where 24 participants took part in the program. Dr. Molly Hagebook from MSI, Washington, DC., USA and Dr. Alexander Borovikh, Centre for NGOs, Russia were the resource persons for the certificate program. Nandita Baruah from USAID and Dr. Achal Bhagat from SARTHAK spoke to the participants on trafficking issues and mental health intervention for victims / survivors of trafficking. During their field trip the participants visited STOP New Delhi; Prayas, New Delhi; Odanadi, Mysore; Socio-Legal Aid Research & Training Centre, Calcutta; ATSEC Bihar and Maiti Nepal in Kathmandu. ATSEC India National Co-ordinator, Mr. Manabendra Mandal helped in organising the program in India. ATSEC National Coordinators meet was held in January 2006 at Kolkata. 20 representatives from State Chapters participated in it. 32 Participants from ATSEC Nepal, ATSEC Bangladesh, ATSEC Pakistan and ATSEC India participated in the Regional Cooperation Meeting held in Kolkata from 7th - 10th March 2006. It was decided that a South Asia Regional ATSEC will be formed in the next regional meet at Kathmandu. ATSEC State Co-ordinates Meet, New Delhi was held on 21st & 22nd July 06 at the India International Centre. Apart from agenda wise discussion Dr. P.M.Nair, Program Coordinator, Anti Human Trafficking, UNODC addressed the participants. 25 representatives from ATSEC State Chapters participated. 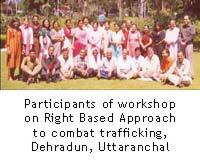 Training on social marketing and livelihood program was organized by ATSEC India in Dehradun from 29th-31st July 2006. 29 representatives from different ATSEC chapters participated. Ms. Julie George from Skill Shares International conducted the workshop. Exposure visit by ATSEC members was organized where 12 participants visited NGOs working on trafficking issues in Nepal & Bangladesh. They also visited ATSEC Bangladesh & Nepal office. National Dissemination Workshop with State Chapter leaders regarding use of IDF was conducted in Tirupati on 26th and 27th February 2006. It was participated by 20 people. 20 people participated in a national level TOT on advocacy and communication skills for the state coordinators to work with the government, policy makers, law enforcing agencies which will help them to make linkages and work for the lobbying, rescue, rehabilitation and repatriation process at Tirupati on 28th February 2006. Exploratory zonal meet with state chapters from the Eastern region was arranged at Betla, Jharkhand on 29th - 30th April 2006 to discuss individual pre-approved IDF and to increase transparency. Numbers of participants were 9. With the participants of 10 representatives exploratory zonal meet with chapters from the north-east to discuss individual pre-approved IDF and to increase transparency was organized at Darjeeling on 12th to 14th June 2006. Southern Zone meet of State Chapters was held on 21st June 2006 to discuss on IDF and to increase transparency of the State Chapters. At Indore exploratory zonal meet with state chapters from North and Central region to discuss individual pre-approved IDF and to increase transparency was carried out on 16th to 17th August 2006 and 46 participants were present in the programme.